Like all of our 100% pure beeswax candles, Honey Candles® 6 inch column candlestick is environmentally-friendly and good for your health, with absolutely no carcinogens or hazardous ingredients, wicks made with cotton, and all natural ingredients. The soft honey aroma carries compounds proven to neutralize airborne allergens and toxins - no wonder beeswax candles have been recommended by the American Lung Association. 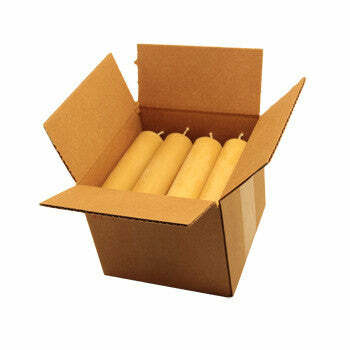 Plus, beeswax candles produce a natural glow that very closely resembles sunlight. You'll love the unique quality of bee wax candlesticks. Tip: Because Honey Candles® 6 Inch Columns are wider than most candlesticks, they may not fit regular holders. Use a candle holder that is designed for a pillar, or better yet, a pillar holder with a spike. This will ensure your column will sit snugly.